Arsenal midfielder Aaron Ramsey will join Italian champions Juventus at the end of the season after agreeing a four-year deal that is believed to be worth a staggering £400,000 a week before tax. 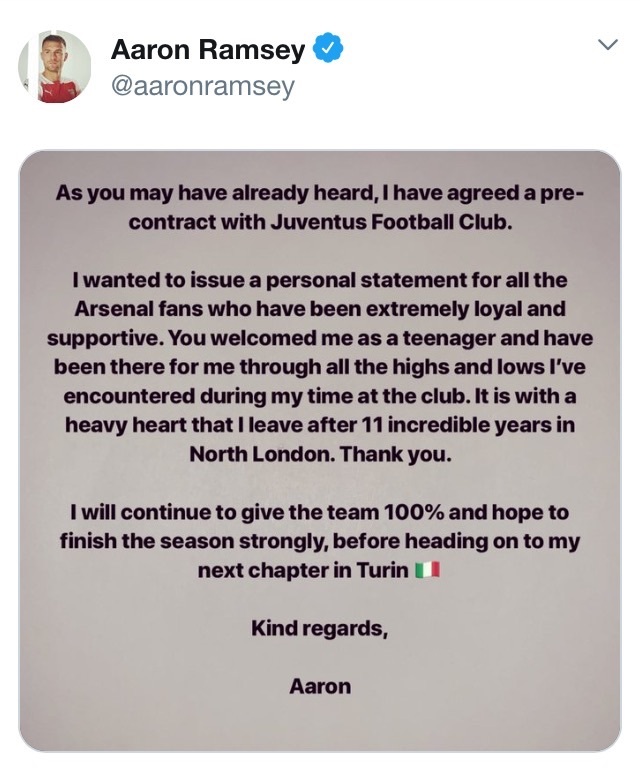 Ramsey has finally put pen to paper on the deal with Juventus, months after it became clear that he would be leaving north London at the end of his current Arsenal contract. The Welsh midfielder has long been expected to complete the move to Turin and passed a medical earlier this year. Juventus said the signing will incur “additional costs” of €3.7 million (£3.24m) to be paid by July 10. In a statement, Ramsey thanked the “extremely loyal and supportive” Arsenal fans for their support during his 11-year career in north London. “You welcomed me as a teenager and have been there for me through all the highs and lows I have encountered during my time at the club,” he said.